Yes, there is a type of basil that is even more wonderful and holy then regular Italian basil. Holy basil is a native of India where it has been used as a medicinal plant for thousands of years. An important component of Ayurvedic medicine, it is difficult to find something that is not made better by this humble basil. Known as the Queen of herbs and a gift of the creator, it holds a special place in the religious temples of Indian Hinduism as well. A member of the genus Ocimum, species tenuiflorum, it shares many pungent qualities with its Italian cousin. It is also known as tulsi. Another similar species is O. sanctum. Thai basil is another family member used in Thai cuisine. There are some twenty species of basil all coming from tropical places. It is grown as an annual in temperate climates. 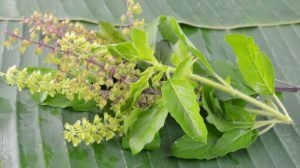 The genus Ocimum is a chemical chameleon that produces many types of essential plant compounds like eugenol, (clove), limonene (lemon), camphor, terpenes and many other healing compounds. According to Herbslist.net, these are just some of the many uses of this purple-flowered powerhouse. Holy basil is also used as a mosquito repellant and its leaves can be mixed with harvested grains to prevent insect damage in storage. Tulsi tea is a tasty and relaxing but pregnant women and people taking blood thinners should not drink tulsi tea. Caron Wenzel is an Environmental Educator, writer, and owner of Blazing Star Inc. a 26-year-old native plant seed nursery, soil amendment and environmental consulting business. For more information visit Blazing-Star.com. Stop Torturing Your Taste Buds – Growing Lettuce and Herbs Hydroponically!